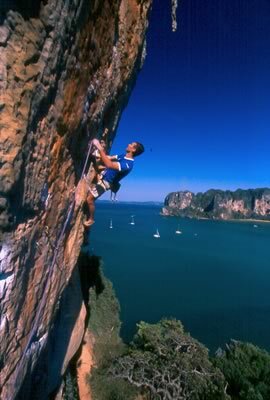 One of the first climbs put up in Railay, and a joy to climb. 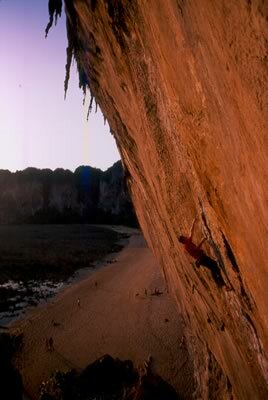 Originally called 123 as it was done in three pitches in the days when there were only 50m ropes. These days you just run the first two pitches together and ignore the last one on account that it is shite. A full 60m the fun really starts on the headwall of the "second" pitch. It is rare that you get such perfect technical moves at such a low grade. The climb finishes 30m above the deck in a mini cave with an amazing view. Classic! 40 meters of pure pleasure- seldom do you come across such a consistently great pitch in such a spot. Every clip is a joy. 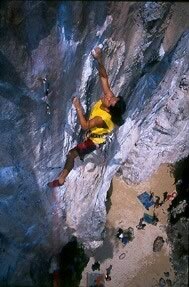 A great lead for anyone, ending in a perfect belay cave. The whole route is good, but the 7a pitch is a classic... 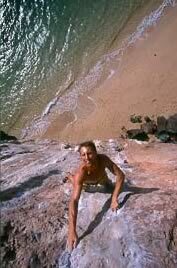 It starts off mellow, before screaming straight up an extremely exposed overhang. What makes it so good, is that it is so much easier then it looks. You can cut loose with your feet, and swing from one giant cauliflower hand hold to another. With the exposure, it kind of feels like flying. Then it tops out at a very convenient cave belay. 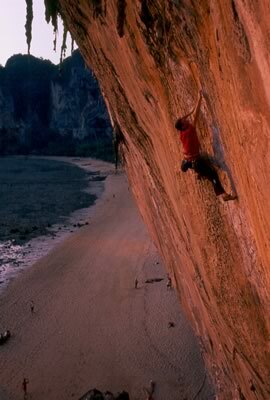 The next 7b pitch is almost as good, but alot more technical. An absolute Classic. It's getting very polished these days and the easy start has become like trying to stand on icy glass, but up above all the moves are quality. 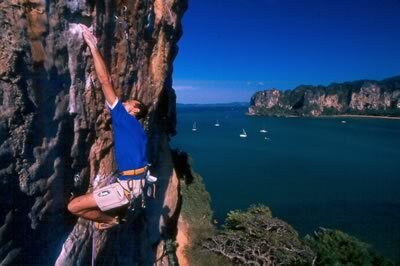 The falls and clips are also excellent, the route overhangs enough that you won't hurt yourself. Not wanting to spoil it, I'll just say that it is pretty cruxy the whole way through. To get through it you really have to keep on moving! King took some great pics of Francois last year on it. Never seen first the crux done like that before, very French..... Nice view! 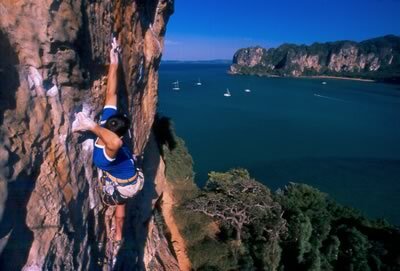 This route can best be described as heroic. It's 30m with 11 bolts, yet still feels run out. The first crux is greasy and thugy. The second plain thugy. The next couple of cruxs are very technical, and on top it eases off a little and runs out. Great moves- epic! 30m of classic 7a+ keeps your intrest right until the very end. 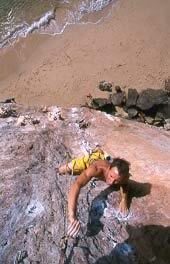 Seen this route spit out alot of good climbers. As you get higher it gets more technical and steeper. 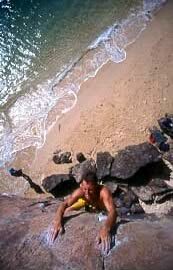 I remember Phil taking a massive whipper pumping out over the anchor. - Great air time. 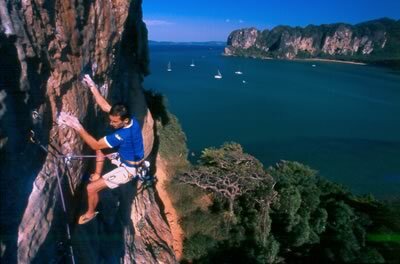 Good to see that it is still possible to put up 4 star routes on Railay. This was a pleasant surprise from Sam. Very well bolted and protected. A little chossy down below, but no doubt will soon be cleaned up. Can't remember it's name or grade- but it was dam fine! 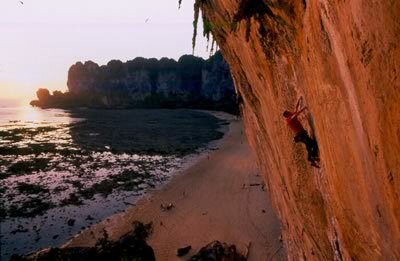 Probably the definitive 6c+ for railay. Solid for it's grade, technical with a good rest in the middle before the crux. The crux is sequency, and will spit you out if you get it wrong. Even if you get it right, there are a few delicate moments before powering through to a pumpy finish. Get there early- after about 11:00 this route gets serious sun, and will fry you. Climb the tree and belay from the tree. 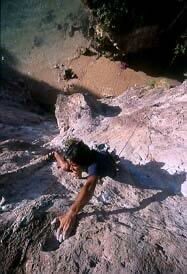 You can run the pitch to the obvious belay station on the upper ledge, but the rope drag is terrible. The climb proper starts from this upper ledge. 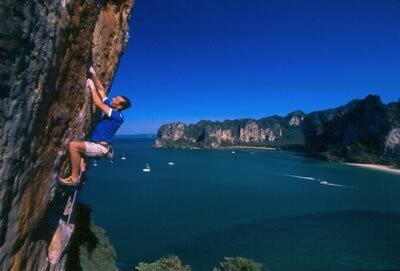 From memory, you can run the next two pitches together to avoid an uncomfortable belay. 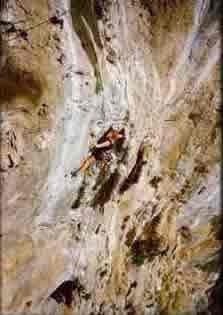 This pitch ends in a good belay cave from which you can kind of hide from the sun. 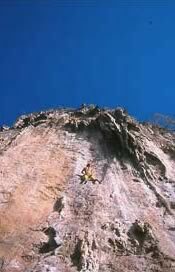 Best to top rope the last pitch. There is a mini add on 6a pitch going out left. Not sure what the state of this is, but it's really not worth it, as it just messes up your belay and decent. You may notice bolts going up from the mini pitch. These lead no where- They (and the 6a mini pitch) were a valiant attempt from Shamick to reach the Goblin eye above, and go beyond. Turned out to be just too hard though. Please be VERY care full not to knock any of the lose rock, particularly on the decent. You've got a pretty good chance of permantly taking out someone on the ground. All in all a great route.